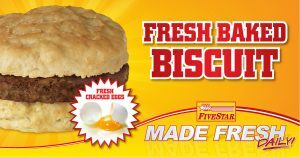 At FiveStar, we take pride in providing excellent customer service and quality products. From the fuel we sell to the fresh food we prepare daily in our Country Deli, we strive to provide the best for our customers. With over 70 locations in Kentucky and Indiana, FiveStar is ready to greet you with fast friendly service. Our commitment to providing the cleanest restrooms in the most convenient locations, make us a leader in our industry. Come in and see all we have to offer and you’ll get the FiveStar treatment, every time!